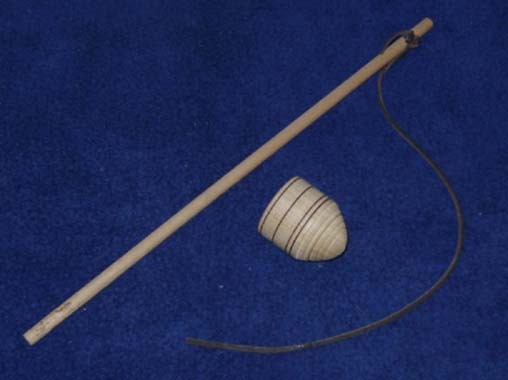 The whip top is another ancient toy with evidence from art dating back centuries. One of the most famous illustrations showing a whip top is a renaissance painting that displays children playing at a variety of activities, including spinning a whip top. The top is first spun between the hands to get it started. Then, the top is flailed with the leather thong on the whip. Because of the presence of the leather thong, we recommend that parents excercise caution in choosing this toy. It should only be used by a mature child who will also take care that bystanders are at a safe distance. The cost of a Whip Top is $5.75.